It is easy to get caught up in the idea that if I am a Christian then I will have a trouble free life. If trouble does come my way, that is just an attack from the enemy. I can pray to God to deliver me from my trials and He will always remove my troubles. I don’t believe this is true based on what I see in reality. We face trials, troubles, tragedies, etc. on a regular basis. Both Christian and non-Christian alike face many of the same tribulations and afflictions. I also don’t believe this is true based on what I see in Scripture. Nowhere in the Bible does Jesus promise us a trouble free life if we turn to Him for our salvation. Jesus actually says in John 16:33 that we will have suffering in this world. That begs the question, is there a purpose to our afflictions? Scripture tells us we will have afflictions and scripture tells us the purpose of those afflictions. “Therefore, since we have been declared righteous by faith, we have peace with God through our Lord Jesus Christ. We have also obtained access through him by faith into this grace in which we stand, and we rejoice in the hope of the glory of God. And not only that, but we also rejoice in our afflictions, because we know that affliction produces endurance, endurance produces proven character, and proven character produces hope. This hope will not disappoint us, because God’s love has been poured out in our hearts through the Holy Spirit who was given to us” (Romans 5:1-5, CSB). In verse 3 above it says that we “rejoice in our afflictions”. How is it that we can rejoice in affliction? How can we have joy when we face hardship? The immediate answer is in verse 1. If our faith is in Christ alone for our salvation then scripture says that we have been declared righteous and have peace before God! Our greatest need is not to have a trouble free life. Our greatest need is to be made right with God! We have sinned against the Holy God and are deserving of the eternal punishment in Hell that our rebellion demands. But God, in His mercy, has sent His Son to live the perfect life we could not live and die the death that we deserve to die, so that any who believe in Him will not perish but have everlasting life! This puts affliction in proper perspective. We can rejoice because we know that it is only temporary whereas our reward that is in Christ Jesus is eternal. Verse 5 says that “God’s love has been poured out in our hearts through the Holy Spirit who was given to us.” At the moment of salvation, when we believe the gospel of Jesus Christ, we are sealed with the Holy Spirit (Eph. 1:13-14). Just think about what that means. The Holy Spirit, the third person of the Triune God, is dwelling inside of you because of Jesus! When we are faced with trials, the Holy Spirit is with us. He strengthens us to endure. He comforts us. He pours out God’s love for us in our hearts. We can rejoice in affliction because we have the Comforter always with us! Lastly, see the purpose of affliction in verses 3 and 4. 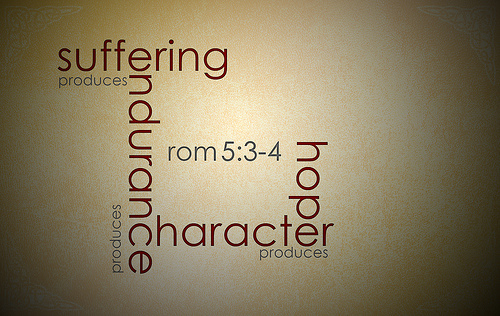 Affliction produces endurance, which produces proven character, which produces hope. It is through affliction that our faith is strengthened as we rely more and more on God. Troubles give us opportunity for our faith to be demonstrated, grown, and matured. Trials are an opportunity to see God’s faithfulness to His promises demonstrated. This then produces hope in us. Not hope in the sense of wishful thinking, but hope in the sense of assurance. We can have confidence in the fact that no matter what we are facing, God is good, trustworthy, faithful, powerful, and will strengthen us to endure as we are grown into the likeness of Christ (Phil. 4:13). We can rejoice in affliction because we know we are not alone and that our affliction is producing hope! We will face affliction in our lives. May we see the purpose of affliction; our good and, ultimately, God’s glory, and let us rejoice in them like the apostle Paul. Let us say like James that we consider it a great joy whenever we experience trials. Not that we relish suffering. Rather that we know, with all assurance, that through affliction our character is being proven, our faith strengthened, the love of God made known to us, and a hope produced that will never disappoint. A hope for us and a hope to share with others that they too may know the saving grace of our Lord Jesus Christ! Can you send your blog to this email? I have been missing them. I also signed Dan up and his ex wife. Hope all is well with you and yours. I sure miss everyone at the hospital. Tell Elizabeth and Grace hello for me.